Microcontroller4beginners is the best site for the beginners to start learn doing microcontroller projects from basics to advanced. INTRODUCTION: Are you worried about the protection to your home? Are you worried about the security of your precious belongings? Are you burdened to pay salary to 'security guard' every month? Then this is the best choice to protect your home and save your money spending on security guards. This is a simple project, the main intention of this project is to make you aware of interfacing micr0controller with simple sensors. AIM: The aim of this project is, whenever an unknown person tries to enter into home through windows then buzzer alerts. We are using a laser beam across the window (look below fig. 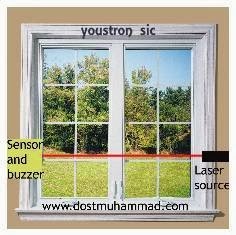 ), Whenever anyone tries to enter through the window then laser light cuts, sensor (L14F1) senses the missing of laser light and sends signal to buzzer and by which buzzer starts beeping..
>> 'ON' the laser source, try to make the laser light beam to fall directly onto the sensor L14F1, which is on the opposite side of the window. >> As long as the light beam fall on the sensor buzzer will be in OFF state. >>As soon as the light beam cuts then microcontroller will make a buzzer ON and alerts. Before going into the project schematic and code, we need to understand few basic modules of the project i.e. Sensor. Here we are using L14F1 sensor to detect the laser beam. 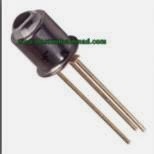 L14F1 Sensor: It is the 3 terminal device, it is a type of transistor which have emitter, base and collector. Look at the below fig. Now let us analyze the connections to microcontroller(pic18f452). >>when L14F1 sense the laser light then 'C' will be short to 'E' so current flows to ground, i.e pin21 will be '0' low. >>As long as the sensor L14F1 senses the laser light then the input 'pin 21' will be '0' i.e low, when the light is cut then pin21 will be high i.e '1'. 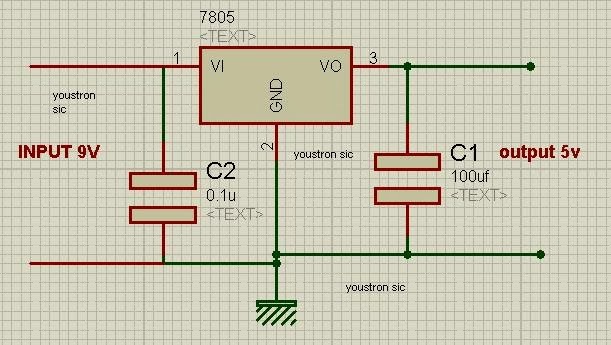 POWER SUPPLY:As we are using 9v input battery , so we need to convert it to 5v using 7805 Ic. i.e crystal oscillator between 13 and 14th pin, pin31=pin12=ground,pin11=pin32=pin1=vcc. MikroC is one of the comprehensive software which have lot of inbuilt libraries. We need not to worry about writing code for general modules interfacing like Lcd's, keypad's, and many more.. so basic idea at C language is enough to code using MikroC compiler. Now let us analyze the code, its very simple code. I can't find the component L14F1 in my country :/ What component can i replace it? 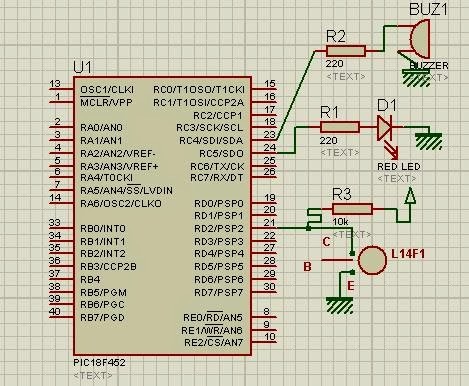 u have used PIC18F452 microcontoller and in description u have told about some pins like pin # 11,12.13,14,31,32 .. but these pins are not available in that microcontroller .. were u drunk while posting about this project ... Correct this project ... !! This is kind of tricky for me especially that I am not into the "mechanical/techy" side. But this idea I would say might actually be good too and yes you are right, money-saving. On the other hand, I got my home security from https://www.getkuna.com/, which by far works really really great for me. You've beaten yourself with this material. This is extraordinary substance. This is my first time i visit here.